Fly Casino is pleased feature this 6-reel, 4,096 ways to win slot game that offers those that have the patience to hit sky high payouts! 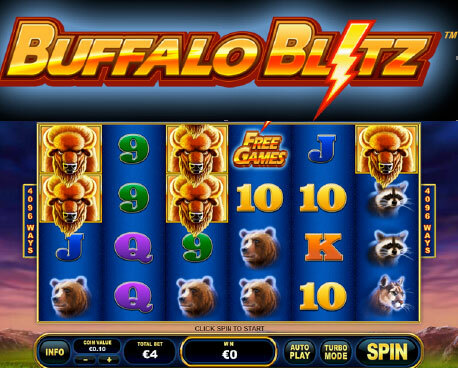 Buffalo Blitz is a rather volatile game and it really is all about the Free Games feature which is triggered when you get 3 or more Free Games scatter symbols anywhere on the reels – 3 will give you 10 free spins, 4 will give you 25 free spins whilst 5 will give you 50 free spins. If you’re lucky enough to get 6 on the reels, you will get a massive 100 free spins! During the free spins feature the wild diamond symbol randomly multiplies wins by 2x, 3x and 5x! All you need is a few buffalo and wild symbols to get huge wins. We’ve seen it happen. Big payouts are a reality! 100% up to 150.00! From 00:00GMT until 23:59 GMT, all members on their deposit of just $/£/€10 or more will receive a 100% bonus up to 150.00. 133% Big Money Tuesday! From 00:00GMT until 23:59 GMT, all members are invited to receive a 133% bonus up to $/£/€ 266.00 on your deposit of just $/£/€10 or more or more.